Reverse One Verse Per Line Hide Column Entry As Stem Show Refs. 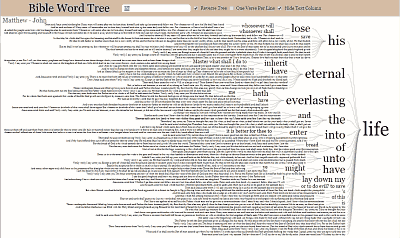 Build a Word Tree From the King James Bible! A Word Tree displays parallel sequences of words in context. Using a tree-like structure and weighted font size it can show a word or words that precede or follow a Root Word within a given text. It also has an interactive display that allows the user to quickly select or enter a new root word or add words to the root. 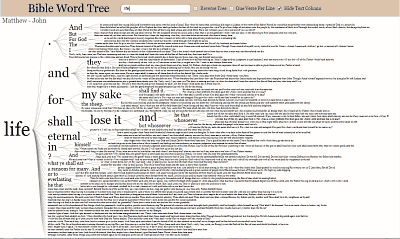 The King James Bible Word Tree is a unique way to visualize Bible words in their various contexts. At a glance one can see all the words that follow (or precede) the root word or phrase and quickly analyzer their usage. Click an image below to generate a Bible Tree. Once there, click on a word to see how the Tree reacts. To generate a custom King James Bible Tree simply enter a Bible book name (i.e. Genesis, Matthew, Romans, etc., including a chapter, like John 3, is optional) in the first entry box and click the Build button. If you want a wider range of text, enter a subsequent book in the third entry. The middle entry is for an optional Root Word. For example, entering Matthew, life, and John respectively will supply the text of the four gospels to the Tree generator and use the word life as the root. Note: To better facilitate display, some punctuation will be omitted. Sentence terminators such as periods, question marks, and similar are retained. See our Illustrated Help Page to show how to fully utilize the Bible Word Tree and also create links to access it from any other site.